The Microsoft Partners in Learning initiative helps students build the skills they need for the future through technology. Partners in Learning works to integrate technology into daily teaching, learning, and research. 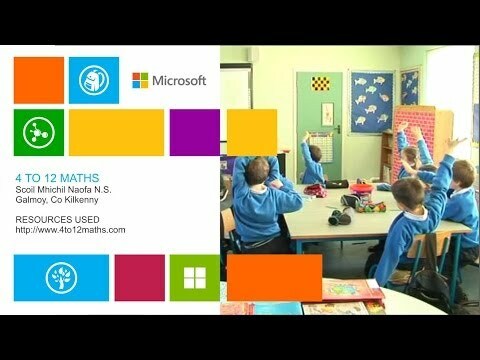 As part of this program, Scoil Mhichil Naofa - Galmoy - Co Kilkenny created a video with Microsoft to show how they use 4to12maths in their school. We use 4to12 maths.com on a daily basis. This is an excellent Irish based website that is geared totally towards the Irish curriculum and has numerous challenges based on every strand-unit of the curriculum. It is also an ideal tool to use in parallel with your teaching as children can refine and enhance their skills being taught by using the website and once a child has mastered a challenge you can be satisfied that a child is ready to move onto the next challenge. Click here to goto the Microsoft - Partners in Learning website and for more details on how Scoil Mhichil Naofa use 4to12maths.